So far we have covered the data bar and color scale options in conditional formatting. Up next is Icon Sets. This conditional formatting option can be very valuable when creating dashboards using Excel. 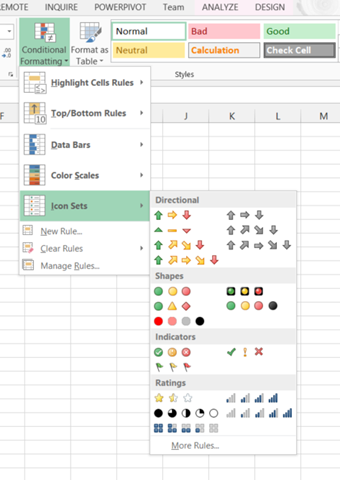 Excel has a number of icon sets that can be used to visualize status and trends. These are organized in Excel into groups based on their usage as shown in the image below. Your specific use case including the data measured and the message to communicate will determine which icon set you choose. Often icon sets are used in scorecards and with key performance indicators (KPIs). When making a choice on icons, it is important to keep in mind what you want to communicate and who your audience is. In the following example we will look at setting up a KPI or status icon set using the tri-color, differing shape set. This is a good choice to represent data that can be shown as “good”, “warning”, or “bad” status. Using shapes as well as colors is particularly helpful if you have color blind users. In my example, I am using a pivot table using Power Pivot data. I have a series of poll questions and the number of submissions. Let’s start with the default implementation. First, click into the cell with the value (in my case, Submission Count). 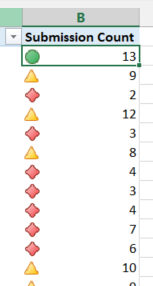 Next, select Conditional Formatting > Icon Sets > <<select the shape noted above>>. This will put an indicator in the field as noted below. As you can see only the field selected has the icon set. What we need to do is apply the formatting to the entire column. That is done by clicking in the cell and then clicking the formatting button that pops up by the cell. As you can see, the formatting has been applied to the entire column. Curious how it was applied? In the ribbon, select Conditional Formatting > Manage Rules. In that dialog, you should see the rule you created. With that rule selected (which is the only rule if you started new), select Edit Rule. In the resulting dialog, you can see that you can change how the rule is applied, the rule time, and the description. Here we will focus on the description. In the description area, you can see the Icon and the values that are applied. By default, it groups it in to percents. This is done by taking the maximum and minimum values and dividing the values into thirds and applying the value. You can change the type from Percent to Number, Formula or Percentile. I often find that I need to use a number for that goal. However, if you use a formula you can refer to a sheet with goals, for instance, that let’s you do some what if scenarios as well. You can also show the icon only which gets closer to the look and feel of a scorecard. I encourage you to explore the possibilities and create scorecards that can be used by your executives, managers, and other users who need to get an overview of how things are going. In the ever changing landscape that is Business Intelligence (or is that Business Analytics? ), a fellow business analyst from Magenic, Chuck Whittemore (B), and I authored a white paper based on our experiences over the past months. What I think makes our work unique, a BI architect and a business analyst came together to show our worlds colliding in the age of modern BI tools. While the goal has always been to bring the data to the users and let them work with it as creatively as possible, the tools to do this were IT focused. What we see now is that with the advent of in-memory, client-side BI tools, users are now able to get to this on their own. Microsoft has invested heavily in Excel to make it a first-class BI tool. Our paper discusses this disruptive nature of the new tools and how Excel is being pushed to the next level. After all, Excel is everywhere already. Enjoy the read and I welcome your feedback. So, you have connected Excel to your SSAS cube. You really wish you could easily drill to details using Excel. 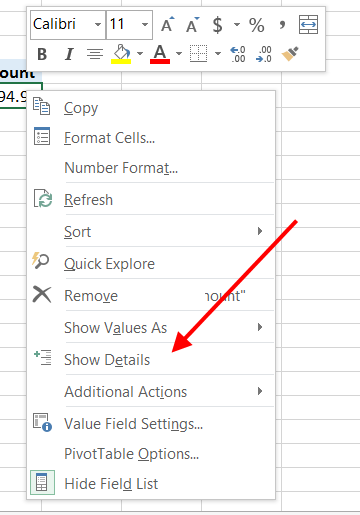 You can do this in Excel 2013 by double clicking the cell or right clicking the cell to get the shortcut menu which includes the option as well. It is really cool that you can just double-click the cell and get there directly. By default, it returns the first thousand rows of detail from the underlying cube data. You can change this in the connection options for your SSAS connection. One “gotcha” on this is that It doesn’t work on a calculated cell, but it works fine on standard measures. If you use a lot of calculated members, you will get the error in both cases. So if this option is important for the users of a specific calculation, you may need to get it into cube as a standard, not calculated, measure. So, you have connected Excel to your SSAS cube. You really wish you could cross drill easily in the product. If you have used PerformancePoint Services you know the process. Right click on the bar or cell and then choose the dimension to drill to using the information you clicked on as a starting point. 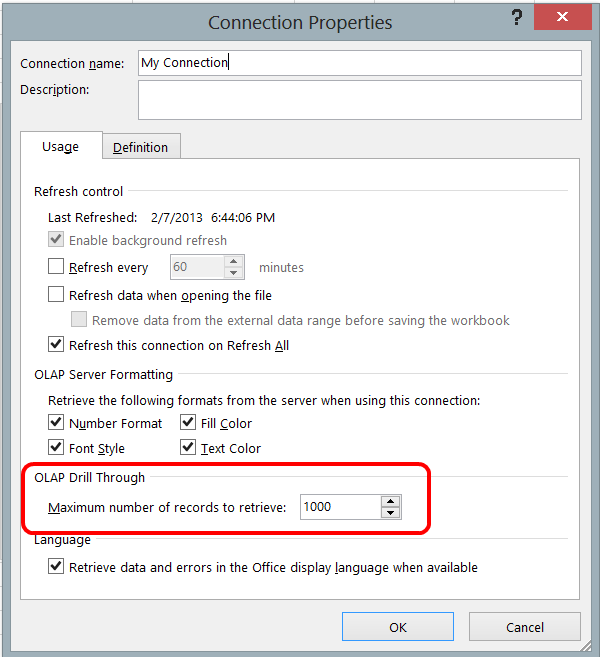 You can now do this in Excel 2013 using Quick Explore. Here’s how to do it. 1. Click on a cell and hover over it. 2. Click the Quick Explore button a.k.a. magnifying glass and lightning bolt. That will pop up the following dialog box. In this box, you can see that the cell has focus on “Boston” based on context and is drilling into the Geography hierarchy of the Client dimension based on the selected filters and slice of data we are focused on. 3. Click the Drill To target. Excel will create a new view of the Pivot Table with the Drill to on the row as shown here with the filter still in place. 4. Going back… One of those frustrating things with this is how do I go back to my original view. Ironically, you use Undo. This will reset the view back to the previous. So, if you choose to drill into this data again and again, you have to Undo that many operations to get back to the starting point. Of course, can click the arrow by the arrow to see your “bread crumb” and pick where you want to go back to as well.